Today’s world is challenging and complex, and as a college president I could allow myself to get caught up in a dilemma. That dilemma would be arguing about the value and purpose of education with intellectuals and academics. They might argue that the value of an education is simply the process of expanding one’s intellectual capacity—and that is a good and noble goal. For those people, education is the end itself. Today, however, in my position, I know that the “great expectation” is to be sure our graduates are ready for the world of work. For many, education is the means to an end. Education, technical training, skill development, many believe, should enable a graduate to be employable. In my experience, this is also the motivation of students of all levels of ability: what they really want is the ability to take care of themselves and the people they care about. In today’s world with the economy in turmoil and high levels of unemployment, the promise or possibility of a good job with benefits seems elusive to many, and concerns about getting a job after college worry a whole generation. But I also know this is not a new issue. Concern about finding employment and having a “decent” life is in the DNA of Americans from all backgrounds. Last spring I was having a discussion with Dr. Martin Lecker, an excellent teacher and scholar. I asked about his summer plans, and he told me he had a fellowship from the National Endowment for the Humanities that would allow him to spend time at the Pullman Museum, studying the history of the Pullman Railroad. I mentioned that my wife’s grandmother had been a cleaner and seamstress for the Pullman Railroad in Memphis, TN. Then, during the summer, Martin emailed me from Chicago and asked for Wylene’s grandmother’s name and other information. Martin said he had access to the employment records of Pullman employees and could get additional information about Wylene’s relative. Wylene was thrilled when a few weeks later she received copies of Grandma’s (Elnora Mitchell McKee’s) employment records. 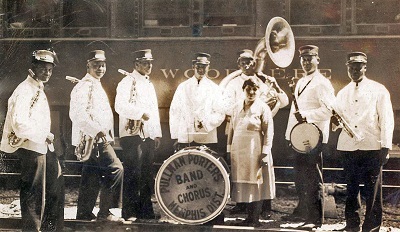 Elnora McKee had been a very special person and had not only cleaned the trains and repaired the seat cushions, but she also sang with the Pullman Band and entertained passengers on the train. She lacked a formal education, but she had honed her skills and worked for Pullman for 23 years. In a recent essay, Wylene described her grandmother in the following way. She was stern and tender, practical and creative, compliant and fierce. Our Grandma, Elnora Mitchell McKee, daughter of George Mitchell and Mary White Mitchell and wife of Hugh “Ras” McKee, was all of this and more. She could cook a fabulous meal of gumbo or fricasseed chicken, rice and green beans, serve Federal Bakery’s brownies or pound cake with her special ambrosia, mow the lawn, paint the fence, repair the gate, build a chest, make a doll, sew a dress, wash clothes in a wash tub and clean them on a washing board and hang them on the line, dose her grands with quinine or Epsom salts, conduct a meeting, give a speech, comfort the sick and grieving, and fall on her knees in prayer three times a day. I tell the story about Elnora because it demonstrates the way in which the world of work has changed over the last fifty years, and that difference is why many Americans feel they no longer have access to the “American Dream.” For, you see, while Elnora McKee’s life was not idyllic as a Black woman in the segregated South in the 50’s, she had what many considered a good middle class life. For, Elnora would tell you she was proud of her work and proud that she had earned a good pension that provided for her and her husband, who retired early because of poor health. He had been a carpenter, a furniture maker. Because of the skills he acquired on the job (OJT), he and Elnora were able to buy a small plot of land on South Parkway West in Memphis and build their own solid, comfortable home. She also sent one of her children to college. However, what the McKees accomplished and what many others from other backgrounds accomplished is no longer possible for many young families. Today individuals must be well-prepared and trained for new kinds of jobs, jobs where competition is fierce, jobs are scarce, and a pension is a thing of the past. So the challenge today for Rockland Community College is to ensure that we are here providing access and opportunity to an education that will allow all students (not just the middle class or the 2%) to have the education/skills they need to acquire a job so they will be able to have a decent home (shelter), food, health care and the resources to be self-sufficient—to take care of themselves and the people they love. To achieve this, educators, public officials, and business leaders all have a responsibility to work together to create a culture where all work is valued and all people have the opportunity to acquire the education and skills needed to keep the “American Dream” alive throughout their lives.